The construction of Shri Rama Mandir began in March 1983 and the temple with Vanavasi Lord Rama & Sita was consecrated on 22nd October 1983. The architecture of the temple is unique in style - a Setu (bridge) between North & South Indian Culture, executed by skilled artists from Karnataka and Tamil Nadu. A magnificent mandapam of black polished granite adorns the entrance of the temple. The Shikara (tower) of the temple, 40 ft high, is in the shape of a crown with three kalashas on the top, representing the highest Truth, declared in the scriptures. Three crore Rama Naam japa books, written by devotees of 24 nations in several languages are deposited at the base of the temple. The black stone idols of Shri Rama and Sita depict the vanavas aspect of Shri Rama. They are made of special soft stone. This is the first temple in the valley for the worship of Lord Rama and Sita in exile in the forests. Through devoted worship of Lord Rama, the devotee's mind gets attuned to the ideal that Shri Rama stands for and is uplifted to receive the showering grace (Amrita) from the kalashas. 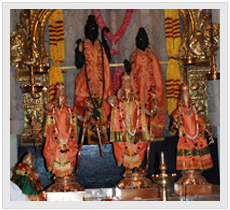 A set of panchaloha (5 metals - gold, silver, copper, iron and lead) idols of Lord Rama, Sita, Lakshman & Hanuman in front of the main idols receive the daily worship. 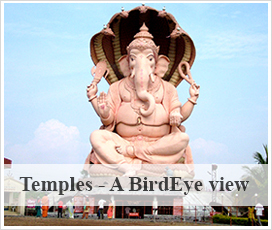 The two elephants in front of the Mahamantapam on both sides are of great attraction to children and visitors.